The wearing of a man wedding ring is a relatively modern phenomenon. 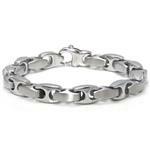 So is the use of Titanium in Titanium men's rings. One of the newest and classiest of the modern jewelry materials, Titanium is setting a standard in the looks of contemporary men's wedding bands. Despite this, titanium rings are reasonably hard to find in your local jewelry store. 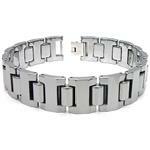 Unfortunately titanium hasn’t quite made it into the consciousness of your local jewelry merchant. 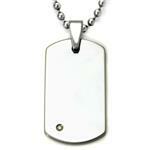 So if you want to find the ultimate in contemporary male jewelry, you have to look further afield. Enter the internet. There is a world of choice on the net for the modern couple searching for the ideal contemporary design men's wedding band. But first, what is titanium? Titanium is a naturally occurring element, not an alloy. In other words it isn’t just a mixture of two or more different metals to produce a third one, as alloys are. That is not to say that Titanium cannot be alloyed with other metals, just that Titanium itself is not an alloy. It is in fact often alloyed with other metals for jewelry making to make it harder, although all Titanium including pure Titanium makes a fine jewelry material. For the more chemically minded amongst us, Titanium is listed in the periodic table as a natural element, atomic number 22. It was named in 1795 after the god Titan. Titanium can even be found in space rocks. The Apollo 17 mission brought back rocks with up to 12% Titanium in them. Because of it’s natural properties Titanium has been primarily used in the aerospace industry, and only more recently applied to jewelry making. But why is Titanium such a great material for making men's wedding bands? A number of reasons. Firstly it is very hard, much harder than traditional ring materials such as gold and silver. It is extremely lightweight, corrosion resistant and very strong. It is so strong in fact that rings are fashioned out of a solid block of metal, so make sure that you get your size right as resizing is usually not an option. It is hypoallergenic, meaning that it cannot produce skin reactions or allergies as can be found with some other ring materials, though rare. But the real reason is that it looks great! 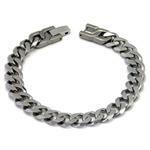 Titanium can be shaped into a wide variety of styles. It can also be colored into a stunning range of colors which can be mixed and matched. For this reason the range of choices in men's Titanium wedding bands is much greater than for a more traditional material such as gold for example. Although gold can be altered to offer a small range of different colors, it is basically gold colored. Titanium offers a much wider range of choices in color. 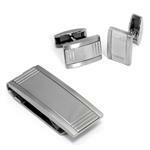 Titanium also offers a choice of finish, most commonly satin, matt or polished. 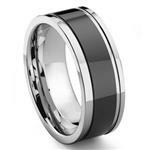 Black Titanium rings are amongst the most eye catching of all the rings. 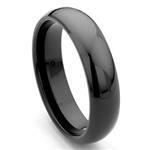 They are usually a mix of black Titanium coupled with another color as an all black ring can be overpowering. But a contemporary style men's ring is almost the ultimate in chic for the man who wants to make a statement. These rings can be coupled with a wide range of precious gemstones, including diamonds, to add effect. 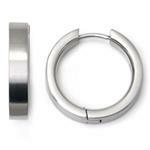 And as Titanium is so strong it is also possible to create tension set titanium rings. What are these? Well the strength of the material is used to suspend a gemstone, say a diamond, between the two ends of the ring so that the gemstone is almost hanging in space in the ring. A totally modern look. The strength of the Titanium keeps it there. And for the more creatively minded amongst us it is possible to design your own men's ring. There are online jewelers who offer the option of making up a design for your ring that is unique only to you. You decide exactly what style, color or mix of colors you want. 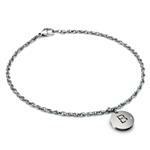 Want to add a gemstone? Or more than one? Where do you want to put it in the ring? It’s all up to you. There is no doubt that the older traditional materials used for making rings make beautiful rings. Gold or silver rings are still high on the list of choices for many men, and modern ring designs in these materials are also impressive. But the modern man who has decided to wear his marital status on his finger shouldn’t buy a ring before he looks at the range of titanium men's wedding rings. The only difficulty is making up your mind which one!